Cornwall Canada Wedding Inspiration. While all brides are beautiful and enchanting, the courageous and bold emotion from this coastal-inspired styled shoot in Cornwall is stirring. With the wild ocean behind her, the bride channels an entirely different aesthetic, one that is fresh and inspiring. The invitation suite evokes the unrestrained style of the shoot, featuring light blue torn parchment and handwritten script. The bouquet is wild and wonderful. With its oversized and texture-filled collection, it speaks to the natural setting. 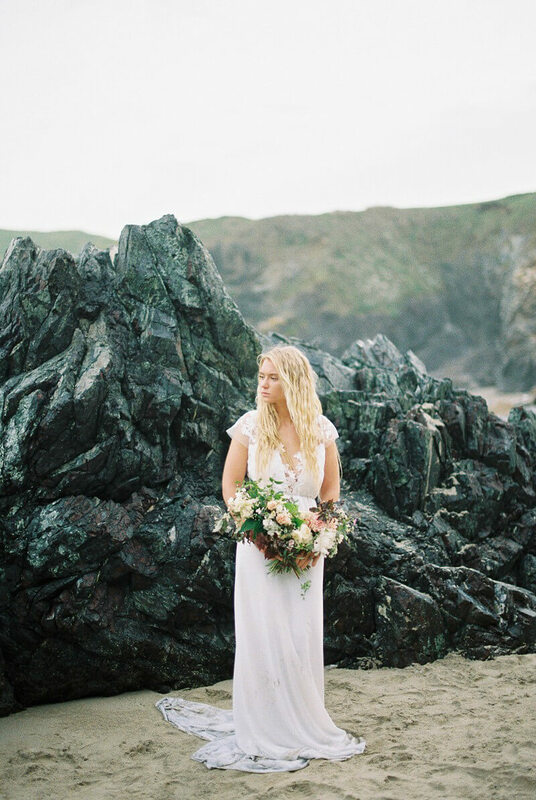 The bride traverses the rocky cliffs of picturesque Cornwall, surrounded by sparse grass and dirt paths. But it’s the look of boundless determination that translates through the lens. On the beach, the hem of her long dress graces the tide and the entire silhouette is on display. This bride doesn’t need a fancy updo. Instead, she embraces her surroundings with beachy waves touched by saltwater. Her makeup is natural and light. And her only accessory is a statement blue bauble. Her gown features a forgiving silhouette that’s perfect for the outdoors. And its V-neck and floral appliques are delicate and lovely. There’s something so raw and emotional as she stands on the shore, eyes closed, letting the breeze pass through her soul. The floral details from the bodice of her gown continues down the open back, a design that infuses a certain softness into the scene. The sun sinks below the horizon and she’s left with the embers of daylight. She holds a candle to illuminate her face, emitting an eerie beauty. She stands amid a collection of candles as the water continues to rage on below, producing a quiet beauty as she closes her eyes and surrenders herself to the night. There’s something so pure and authentic about this styled shoot in Cornwall. It exposes the beauty in strength and confidence while maintaining a sense of femininity and grace - an expression of empowerment fitting for any bride.